Wright Stuff Rocketeers is Section 703 of the National Association of Rocketry, the sport rocketry hobby’s foremost national organization. Based in Dayton, we serve the greater southwestern Ohio region. We are a well-equipped section, with complete low-power and high-power ground support equipment like launch systems, pads, rods and rails, and PA equipment for on-the-field communications. We fly in accordance with the NAR Model and High Power Rocketry Safety Codes, so we’re covered by the NAR’s general liability insurance at our activities. Our members have literally centuries of building and flying experience. From the smallest MicroMaxx to giant high-power projects, wood glue to fiberglass and composites, simple park flyers to the most detailed and accurate scale models – we’ve built them all. Got a project in your head that needs to get onto the work bench? New to dual-deployment? Come see us. With local vendor support from eRockets and Merlin Missiles, all the parts are close at hand to make your dream project a reality! Drop in to one of our Tuesday night build sessions, and you’ll have the environment you need to focus on your build. The most rewarding part of any hobby is introducing new people to it! WSR plays a vital role in growing the hobby – and helping you attain your curriculum goals – by reaching out to groups like Scouts, 4H, and schools to hold build & fly sessions. Our members also serve as mentors for Team America Rocketry Challenge (TARC) teams, who compete against teams all over the country and around the world. We’ll help select rockets that are appropriate for the age group and the engines to power them. We’ll supply the equipment and people to get them into the air safely. You pay only for the rockets and motors. The NAR offers a rich competition program, where rocketeers use their skills to design and build rockets that will satisfy specific missions such as time spent aloft (duration events), carrying objects into the sky and returning them safely (payload and egg-lofting events), and making incredibly detailed and historically accurate models of rockets from the military, NASA and science fiction (scale events). WSR members excel in many of these events, and starting in 2015, we as a section began hosting regional competitions at our fields. To compete with us, you simply need to be a current NAR member (sign-ups are available at the field). We’re always up to something. We challenge ourselves. To us, good enough just isn’t. We can always make it fly higher, faster, and safer. 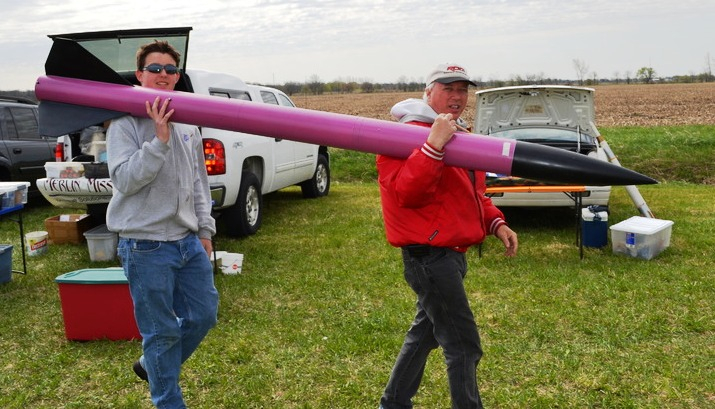 Our members strive to get the most out of sport rocketry. And we want to help you experience it too. Whether you’re new to the hobby or you have rockets that have been stowed away for years, it’s time to get to the pad and fly! Consider joining the Wright Stuff Rocketeers today.